If you live in an older house, you have probably noticed that you spend a lot of money keeping it warm in the winter. You may also notice that even when the house is warm inside, some of the walls feel cold to the touch or have condensation. That’s because most pre-1920’s homes (which includes most terraced houses) have solid brick walls which are poor at keeping in the heat. The good news is this – solid walls can be treated with External Wall Insulation. 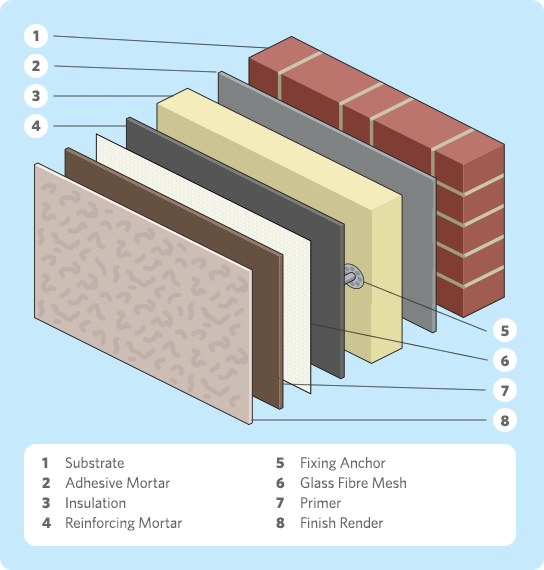 How does external wall insulation work? How do you know if your house is suitable? How can you get a grant to help with the cost? Read on and find out. External wall insulation is also known as “solid wall insulation”, and sometimes just shortened to EWI. It is used to insulate houses that do not have cavity walls. These are usually older homes (pre-1920’s), including many traditional terraced houses. If you are not sure what type of walls your house has, this article explains how to find out. External wall insulation is attached to the outside walls of a house, covered in several protective layers, and finished off with either render or another decorative finish. Do you need external wall insulation? Cavity wall insulation is easier and cheaper to install than external wall insulation. EWI is designed only for properties that either a) do not have cavity walls, or b) are ‘hard to treat’ e.g. the cavities are too small to insulate. If your house has cavity walls that can be treated, then you won’t qualify for free external wall insulation. If you’re not sure what type of insulation you need, please get in touch with one of our energy surveyors. Similar to cavity wall insulation, EWI creates a barrier that stops heat escaping through your walls. Unlike loft and cavity insulation however, EWI uses a rigid insulation material – expanded polystyrene slabs. Expanded polystyrene contains thousands of trapped air pockets, which makes it an extremely good insulator. It is also easy to cut to into shape, meaning it can fit neatly around windows, door frames and other architectural features. The slabs are held in place with fixing anchors which are drilled into the existing walls, and then covered with a layer of reinforcing mortar. This is covered with a glass fibre mesh, which when dry gives the insulation system its structural strength. Finally, a primer layer and a decorative render go on, making the house look as good as new (or dare we say it, better than new!) The insulation adds about 9cm to the thickness of your walls, so the shape of your house will not look drastically different. The process does take several days, depending on the weather. Luckily for you the work all takes place outside, so other than having to walk under the scaffolding when you go in and out of the house there is very little disruption. Without the help of a grant or funding, solid wall insulation can cost up to £8000 — and often the people who need it the most are on lower incomes. Luckily there are grants available that cover 100% of the cost, if you receive certain benefits and/or live in a selected area. The GEARS scheme provides free external wall insulation for qualifying households — you can find out if you are eligible for GEARS here. As usual, grants and government policies often change, so we advise that you get in there quickly. We can arrange for a Go Greena energy surveyor to inspect your property and give you advice. The survey is free and no-obligation, and takes about a minute to book online — which you can do here. You could be eligible for a FREE energy efficient boiler — which could save you up to £300 a year! See our free boilers page to find out more.